In operations since 2005, FP Markets is an established online forex and CFD broker, regulated and authorized by the Australian Investments and Securities Commission in Australia. Traders get access to many markets such as the Forex, indices, futures, equity, and commodities market under the broker’s single platform. The firm has its head office in Sydney, Australia and several representative offices located in Shanghai and Beijing. Traders enjoy commission-free trade on standard accounts, tight spreads, fast execution and flexible leverage. 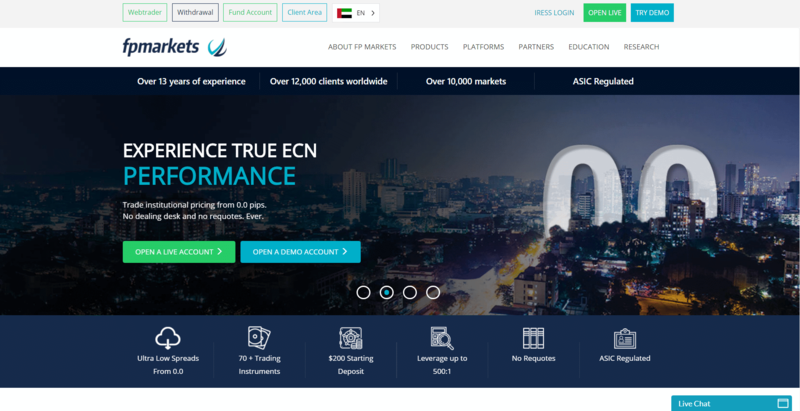 Account: FP Markets offers a Standard and an ECN Raw account for Forex trading. The standard account is a commission-free trading account with spreads starting from 1.0 pip, while the ECN account carries a commission and offers tighter spreads, as low as 0.0 pips. The broker also provides a free demo account on its MT4 platform. However, it should be noted that the firm does not accept US traders. Features: The award-winning forex broker offers over 10000 trading instruments including 50+ currency pairs for trade. There is no dealing desk, slippage or re-quotes. Along with the popular MT4 trading platform, the broker also offers IRESS platform that provides multi-product execution and automatic order options. Trade alerts, live news, and pricing and charting tools can be accessed. Accounts can be traded on the web as well as mobile platforms including the broker’s mobile trading application. Education: FP Markets has built comprehensive courses for beginner, intermediate and advanced traders through video tutorials and Ebooks in the education section of its website. Deposits/Withdrawals: Deposit options such as credit cards, e-wallets, and bank wire transfer are available with transaction charges varying from 1.75 – 4%. The same funding options are also available for withdrawals with a processing time of 2-5 days. Customer service: Customer support can be reached through email, phone, live chat, social media and the broker’s multi-lingual website on all trading days. User reviews: Check out more FP Markets Reviews below.